A sampling of five different colors of granite, from white to black, used for kitchen countertop surfaces. Use the space on your countertops to cut vegetables and meats, prepare meals, and store appliances. Choose kitchen counters in colors that complement the rest of your kitchen, or choose your countertop for utilitarian reasons. 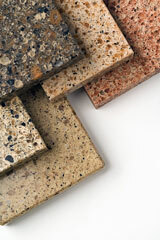 Granite, soapstone, concrete, and laminate are just a few types of countertop surfaces. Lay the makings of your meal on your kitchen countertop, knowing that you are preparing a wonderful meal for you and your family to enjoy. Use the search box on this page to find information about countertop designs and styles.